Hi! 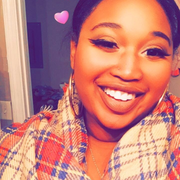 My name is Dominique, I am a rising college Senior at Bridgewater State University pursuing my Bachelor’s Degree in Psychology with a double minor in Middle East and African American Studies. I have 24 nieces and nephews, and have taken care of many of them, so I have no issue with taking care of children. I am also a volunteer tutor with School On Wheels of Massachusetts in the Brockton area. I am multilingual, speaking English, Spanish and some Arabic. I am an attentive sitter, especially when it comes to infants/toddlers. I am also available for homework help.